Engagement ring designs come in many shapes and sizes. When you start shopping for an engagement ring, you’ll be surprised at the selection. Many people think rings are boring, but that’s far from true. Once you start to pay attention to the artistry, you’ll realize how intricate and creative some rings are. Let’s take a moment to discuss some of the more popular engagement ring designs. 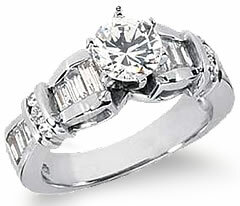 Gone are the days when engagement ring designs consisted mostly of round diamonds. These days, couples can choose diamonds cut into a variety of shapes. Engagement ring designs can contain diamonds cut into just about any shape imaginable. Round – this is the standard round cut diamond. Many engagement ring designs rely on this shape because it’s traditional. Oval – similar to the round shape, but slightly different. An oval is symmetrical and elongated. Engagement ring designs that incorporate ovals are great for small hands or stocky fingers. Marquise – this shape is elongated similar to the oval, but has sharp pointed ends. Engagement ring designs that incorporate the marquise look are great for solitaires. Pear – the pear is known as a designer, or hybrid, cut. It’s like a cross between the oval and marquise. The easiest way to describe it is as a small raindrop. This style is more common with pendants or earrings, but it’s also used in some engagement ring designs. Heart – the heart is a universal symbol of love, so it’s no surprise that some engagement ring designs use this symbol. It’s difficult to cut a heart, so the jeweler must be exceptionally skilled. If you want a heart shaped diamond ring, make sure its cut is well-defined. You want it to look like a diamond, not a blob. Emerald – this shape is rectangular with cut, not sharp, corners. It has broad, flat surfaces that resemble steps. In fact, it’s known as a step cut. Engagement ring designs using the emerald cut must contain good quality stones. Unlike other designs which can hide flaws, the emerald shape highlights them. Princess – this square cut diamond is often used in engagement ring designs using the solitaire style. It looks best on hands with long fingers. Men’s engagement ring designs are different from those for women. Most men’s engagement ring designs focus on the band. The band is usually made of white or yellow gold, or platinum. Then it is often engraved with an intricate design, name, date, or declaration of love. Even when diamonds are included on a man’s ring, they are often understated. Engagement ring designs seek to appeal to many different people. So before you decide on a design, be sure it’s something your significant other will appreciate. Try to match the design with the style and personality of your intended.